on some of these values,"
eron and Midrasha teacher, Stephanie Fisch, Jennifer Gomberg, Liza Becker. Irving Baron, Tournament Chair, Florence Geller. called, Shut The Door, in which the children learned about the futility and agony of arguing. the class is still ongoing. ant to know what's going on." $20.00 includes program & Kosher luncheon. I nited Jewish \ppeal Campaign. educational part was good too. funded by the Horace W.
in Seattle for the national convention of Sephardic Jews. Sephardic American populations right here in Florida." they are one family and many of their customs unify them. makes an effort to preserve and pass on the traditions. lites and and cable TV. live from the Airport Hilton. niece Esther, queen of Persia. dency of the Jewish people. Jews in a communal setting. talism is lapping at new, untrodden shores. ephemeral mind-control in the world of ideas. believe what not too long ago. cism of Hitler and Stalin. garded as a sacred act to do so. be denied any further U.S.
wleS' J,lling a 4-year old child? EJht -en! i their Hu""
toss of their Human Rights? according to a ministerial committee report just released. dented incidence of forest and grass fires in Israel in 1988.
flames. A dunam approximately equals a quarter acre. intends to fly some 1,000 Israeli tourists to China this year. available to China, ranging from $3,300 to $6,000. can join groups of tourists in Hong Kong for China tours. He said that Israelis can visit Tibet as well. about the PLO's ability to carry out their commitment,"
award of the Berlin International Film Festival here. main festivals along with Cannes and Venice. directed by Eli Cohen and produced by Eytan Even. some other fund this year. benefit of the new committee. the benefit of the Federation. this particular form of gift. is arrived at for tax purposes. man, Michael A. Lampert, H.
legal and tax advisors, Mr.
tion laws are tough on paper. ing the other for the lag. office for collection of fines. to 100 cases per year. OLUm T fforBnn us?' Michael Pelavin asked. March 17 at 8 p.m.
and boards of the Joseph L.
success of their past histories. nant on the Temple Mount. usalem is built on a mountain. of Judaism's most holy site. week, you could still feel it. used to be during what they call "the good old days." We turn electricity on and off without a second thought. up immediately to make more little frozen beauties. down two or three pennies wrapped in a bit of newspaper. meaning to the generosity of Jewish people. miracle it is to get so much music from such a tiny cassette. washboards yet), rinsed, squeezed and hung out to dry. naive but I still cannot get over this magic. from a little box on the table and this simply fascinates me. one to knock a good thing. all and may you enjoy happy years of your future. Senior Smarts competition to participants. ages Seniors to exercise their qualify for the state nnais. in whole or in part." woman for the company said. merce Department s Office of K v g^. Please return the attached card. the Moslem and Arab world. the Israelites in the desert. children of Israel. Akim means "to habilitate" in Hebrew. Road) beginning at 8:45 a.m.
cial Secretary and Chairperson of Scholarship Luncheon. Sunday, March 26th, 7 p.m.
music, comedy and pure joy! on the eve and morning of the holiday. are delivered to friends and relatives. Hamantashen is the traditional sweet pastry eaten at Purim. a choice of fillings which can be used in any of them. simmer until milk is absorbed. rind to preserves; stir well. remain at a premium price. open their doors to all who come during the holiday season. branches for building a sukkah may go through the roof. ship until the Sabbath ended." stud in only one ear. appearance on the 6:30 a.m.
"Don't Let the Light Go Out." not let our people down! knead until dough forms a mass and leaves the sides of bowl. bodily harm to the diplomat. form, the joke is really on us. 'tis that I may not weep." something so tiny mads it so big. Abraham Mehler is seated at left. that makes living a pleasure. joy cometh in the morning." seas to help lift their morale. larly touched by one episode. life the sound of laughter." Temple of Aaron Congregation in St.
to obstruct a civil lawsuit. that "we won't visit his hotel,"
will not be visiting his hotel." international rates brochure 1 MO 074-4000.
and Vevee Gross, Co-Chairs, Bent Tree West. come and shake this belief,"
Mildred KeUner, Co-chairs, Banyan Springs. authority to threaten his life,"
the 'safety net,' he said. Israel and from each other"
the West Bank," Chernin said. "led the personal touch of imfcssionals with 30 years of experience." Stolzer, Campaign Director, Barry Rudel, Guest Speaker. bath Services Mr. and Mrs.
March 23. Bus leaves at 8 a.m.
from Carteret Bank at C.V.
and munchies provided. Cost: $4. beer and munchies available off the menu. Director of Fla. Region American Israeli Affairs Comm. Good Disguise?" Refreshments will be served. Cost: $1. Say To The Children About New Partners In Your Life?" whose specialty is counseling young children and parents. for children under age five. activities for this specific age group. we will gather. Cost: $3 admission fee. May. Your input is welcome so join us. place. Come join us for a cozy, homey, friendly brunch. with payment are a must no later than March 20th. For more information, please call the JCC 689-7700.
teret Bank at C.V., W.P.B. Geller, director of the center. and a surprise musical treat. 100 Sunrise Ave. Palm Beach. Royce Hotel at 10 a.m.
gram director of WPBR. Mr.
nosis is for worse to come." grave risks to Israel's security. Israel war would be inevitable. last week in Boynton Beach. and one sister, Sylvia Glasser. Friday Forum Series, 8 p.m.
Bonds Dinner Dance, 6:30 p.m.
ity Center, Children's Performing Arts Series, 2 p.m.
AIPAC Special Gifts Event, 4 p.m. and 8 p.m.
Shalom, noon Hadassah, Henrietta Szold, 1 p.m.
p.m. Federation, Phon-A-Thon, 7:30 p.m. Leadership Development Task Force, 6:30 p.m.
show that features weekly guests and call-in discussions. services 8:30 a.m. and 5 p.m. Friday night 5 p.m. and 8:15 p.m.
Saturday 9 a.m. and 5:30 p.m.
be served. The time is noon. telling is sponsored by Dr.
Megillah (the Book of Esther). on March 22 at 10:30 a.m.
shen and bagels will be served. 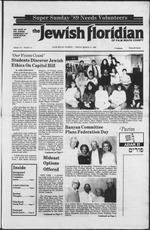 eration Campaign in the U.S.
duced in the Senate by Sens. in the 1989 fiscal year. like to put it on the fast track,"
be entitled to government aid. FINNE, Esther S., 97 of Lake Worth. SERIL, Francine, 84, of Lake Worth. ments of $39.95. Ask for details. 5 mg. "tar", 0.5 mg. nicotine av. per cigarette by FTC method.